Hugging a high ridge on the privacy of 22 acres with unsurpassed mountain views to North and South, Kangaroos in the Top Paddock also adjoins the Grampians National Park. 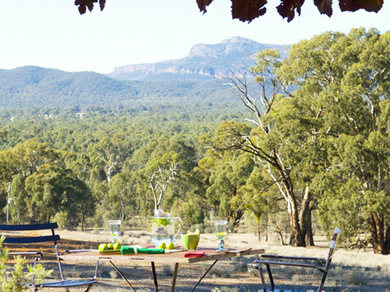 Secluded and self-contained, on 22 acres of unspoilt bushland bordering the beautiful Grampians National Park. Expect spectacular views. The many kangaroos graze peacefully at dawn and dusk, when the sun paints the mountain ranges a glowing pink. No detail has been spared; every glance brings a new discovery – from the polished terra-cotta floors inset with river pebbles to the hand-forged door fittings and colourful textiles. The stone fireplace with its cosy wood fire forms a relaxing focal point in winter. The density of the rammed earth walls maintain an even temperature. Building materials are predominantly earth, timber and stone – all textiles are natural fibres. Windows are oriented to both capture the magnificent views and to take advantage of the of the morning sun, which in winter, casts a warm glow on the vine-covered front terrace which, in autumn, is ablaze with colour. The afternoon sun fills the rear walled citrus and herb gardens with warmth and aroma. In summer, the shady vine-clad pergola has a cooling effect. Native plantings attract a host of diverse birds and animals to the garden. The mass planting of native Thryptomene is a wonderful sight when it flowers in early spring. All water used is harvested from absolutely pristine rainwater. Greywater and composting minimise waste and environmental impact. A central slow-burning wood fire utilises fallen timber on the site. We do ask all guests to be conscious of wood, water and electricity consumption as these are now precious resources upon the earth. The 2 bedrooms have stylishly different décor , both with queen beds and full ensuite bathrooms. The retreat commands inspiring mountain views from each window. Watch the many native birds and the kangaroos grazing outside your bedroom window. Privacy is ensured - each bedroom is separated by a vast living area.